This wooden frame leg rest/footstool adjusts to suit the users comfort and position. 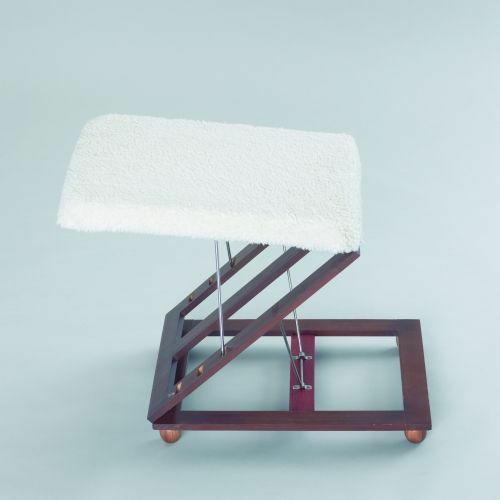 The user can use the rest up to stimulate leg circulation, folded to soothe thighs and keep the feet warm, or use angled to rest aching legs. The base has four wooden ball feet, which help to stabilise the rest whilst used. Foldable for easy storage and travelling. I bought this for an older lady as a replacement. Her previous leg rest had fallen apart and resuscitation (glue!) was no longer an option. The elements of the design that she liked (the Z fold and being easy/light to move about) are, of course, also its downfall; but the first one lasted a good long time and I had no qualms in ordering a second. The leg rest is fine for me but I understand the review comment that it is flimsy. 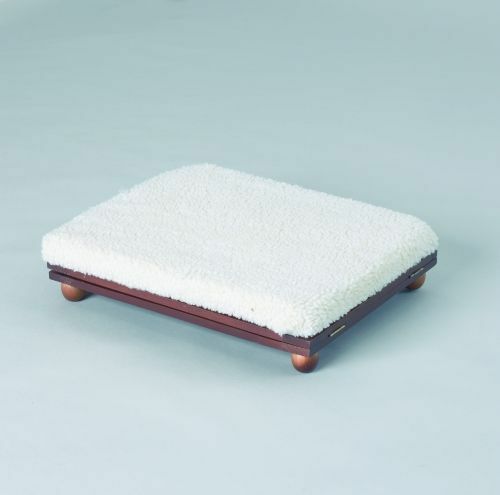 Ideal for elevating swollen legs at the correct level.The fluffy cushion is very soft and comfortable my Mum is delighted with the purchase and unlike other stools her legs do not move off if she falls to sleep.